This is Paul, hiding mysteriously among his vines. We are very excited to announce our latest discovery and addition to our portfolio: Deep Creek Cellars from Maryland. Yes, that’s right, we said Maryland! Jenny blind-tasted the staff recently on the wine and we all guessed the wine was French, a bright and fresh carbonic “vin de soif” (wine-for-thirst) style wine. Some thought it was from Beaujolais, others thought the strong backbone of earth placed it as one of the wines François made from his own vines in Burgundy that we will get in to New York sometime this year. We were shocked to discover the wine was from the East Coast of the US. There is quite clearly nothing else like this wine from this part of the world. I sat down on the phone with winemaker Paul Roberts recently to discuss how he came to produce this wonderful wine. Paul explained to me that he wanted to make wine from organically grown grapes primarily to protect his own health as well as that of his customers. He would have been the person using an air sprayer and hazmat suit to spray the chemicals on the vines, and he just couldn’t bring himself to do it. He also believes that trace amounts are bound to make their way into the wine, and he doesn’t see how that can be healthy. Having said that, Paul explained to me that working organically on the East Coast presents its own very special and unique challenges. 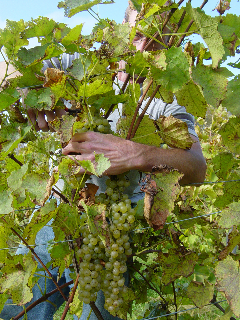 There are five diseases that can affect vines in this region, which Paul said as far as he knows is unique in the winemaking regions of the world. Two of these diseases, downy and powdery mildew, are quite common and combatted around the world with the use of copper and sulfate sprays (perfectly accepted sprays in organic viticulture). But while the other three –phomopsis, anthracnose, and black rot– are not unheard of in other regions, if they become established during a high-moisture Eastern summer they can devastate an entire vintage of grapes. Two of the three diseases are completely unhindered by organic sprays and preparations. Paul explained to me the black rot is a type of fungus that forms on the leaves and grapes, and once it appears, it can spread like wildfire throughout the entire vineyard. Once this happens, the entire vintage will surely be lost. Paul does grow some European Vitis Vinifera, but considering these challenges, he prefers Frontenac, a hybrid grape variety bred to be very disease resistant. He explained that the lineage of this grape is quite complex, but involves the crossing of several American varieties and an unheralded Vinifera. Paul found through trial and error over 10 years that a traditional fermentation of Frontenac produces a wine far too acidic to drink. After many failures in making a drinkable wine, a few years ago he did some research and discovered that the last-ditch effort of French winemakers in such a bind was to make a nouveau style wine using carbonic maceration. He was delighted to discover that the carbonic style made the acidity very pleasant and the fermentation took place easily and quickly with native yeasts. This produced the beautiful wine we tasted. Paul doesn’t make much of this wine, just four barrels worth. If you’re in the trade or press, he will be at our portfolio tasting coming up on February 15th as part of Winemakers’ Week, pouring samples of the wine so you can taste it for yourself. If you’re not in the trade, don’t worry, you won’t have to wait long as we expect this wine to quickly make it to the shelf at the shockingly low $15 dollar price point.